Have you heard the advice, “dress for the job you want, not the job you have”? This is true in business, and most certainly in queen contests. When you compete, and later as you interview for your first job, it’s important to put your most professional foot forward---and, not necessarily your most fashionable. And, nothing says that more than clean, well-fitted, and planned attire. These are great examples of fashion-forward Western party attire outfits. Each contestant shows her unique style, yet all outfits are modest and Western-inspired. Photo credit: Miss Rodeo America. The prices seen on a quick search around a second-hand rodeo queen clothing exchange group on Facebook, in an online forum, or on the Website of a custom clothing designer will turn even the most iron stomachs. Clothes are expensive, and are often the reason that girls either don’t get involved or don’t commit to higher levels of competition. Luckily, there’s more to appearance than the price of the clothes. It’s important to keep in mind that it’s not always about how great your clothing looks, but about how great you look in the clothing. Here you’re thinking, “Okay, thanks lady for your great advice about how to compete against the girl who showed up in all designer clothing. It doesn't apply to me.” It’s true though that competitions aren’t won with clothes; they’re won with skill. And guess what, this is great news because hustle is free. As far as appearance at a contest goes, how you wear your outfit far exceeds the value of the outfit itself. A clean, well-fitted dress, suit, or blouse will always look more put-together than an expensive item that hangs on you like a burlap sack or is a little too tight to be appropriate. So, when in doubt go simple, flattering, and appropriate to the contest. Be mindful of the shape of the clothing; dressing for your body type is a quick way to improve your look without tailoring. Not every girl's cut out to rock a mermaid style dress, but she may look great in something that tapers and then flares from the waist. Dress for your body is a great rule of thumb whether you drop choose custom or secondhand options. If you don't know your body type and what looks best, do some research! You're learning these skills for the long-game, not just for your pageant goals, so really invest in your education. Sequins (in horsemanship when not allowed, all-sequin dresses/shirts). Read the pageant guidelines carefully, and follow them. If the rules specify that contestants must wear a white blouse and 5-pocket Wranglers for horsemanship then do that. If there’s some flexibility, look to examples at other competitions, such as Miss Rodeo America or state pageants for inspiration (or email us and we’ll help you!). So, in the case of very strict guidelines, how do you make yourself stand out when everyone’s in the same outfit? The basics: clean lines, good fit, and smart accessories (and, of course, preparedness!). Here are the unknown-known guidelines every girl should know as she starts out or looks to step up in her competition level. It’s about time these be published somewhere, am I right? 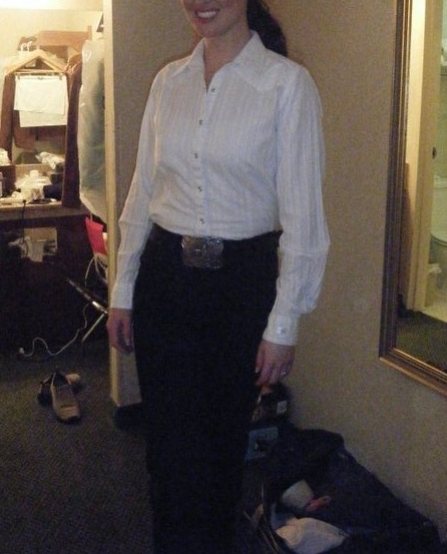 At many local pageants, a simple white button-up with blue or black 5-pocket Wranglers are expected for Horsemanship. Wear sponsor brands. A very important rule in the rodeo queen competition world. Sponsors ensure that the rodeo thrives, so as spokeswoman, we promote them because they help us. Jeans are Wrangler; boots, Justin; hats, Resistol (Miss Rodeo America is sponsored by Greeley Hat Works, so that’s also safe). Easy on the jewelry. Don’t wear anything that’ll distract from your riding, such as dangling earrings or bulky necklaces and bracelets. Monochromatic makes for mile-long legs. Solid colors minimize distraction, such as leg movement as you cue, and create a long line so you appear long and lean (even if you aren’t). Where are all my short girls? Hat. A well-shaped felt hat that flatters your face. The rule of thumb is to wear white if the event’s in the morning and black in the evening, but this is more a matter of taste than rule. At larger and state pageants, monochromatic horsemanship outfits are typical. Choose a color that looks nice on you and showcase your personality. One-piece dresses – These can be made from any material. Some common options are leather (typically lighter lambskin), suede, and linen. Modeling boots – Again, these have a higher heeler, taller shaft, and match the color of the hem of the skirt. Earrings only – You can get away with flashier earrings, but bulky necklaces and bracelets are just that, bulky and distracting. Hat – A well-shaped felt hat that flatters your face. The rule of thumb is to wear white if the event’s in the morning and black in the evening, but this is more a matter of taste than rule. Two-piece dress suit – Matching color blazer and skirt combination with a neutral-colored undershirt (white, black, cream) for personal interviews. Jeans and blazer with similar neutral-colored undershirt for horsemanship interviews. Modeling boots – These have a higher heel and taller shaft (top of the boot) and typically match the color of the hem of the skirt you’re wearing. Simple, classic jewelry – Silver or gold earring and necklace sets are great for interviews. Don’t feel like you have to overdo it here, just find something classy that you like. State representatives wear fashion-forward outfits at appearances, which is acceptable. At Miss Rodeo America, these same women compete in attire that adheres to the MRA pageant guidelines for that year. Always read your rules! When you’ve taken a position, won a contest, and are representing in the community, it’s perfectly acceptable to adapt to the trends you see around you, take some risks, and show personality in the clothes you choose. But, remember this comes after you’ve earned the ability to do so. The same is true when you’ve secured a job in your later career. There’s flexibility after you’ve earned it---not at the interview. Dress appropriately for the circumstances and then have fun. If you know you’re going to a rodeo, wear your chaps and an appropriate shirt for grand entry. If you’re going to a breakfast and choose to wear a ¾ sleeve business casual blazer instead of a leather suit, that’s great! Just make sure that it’s well fitted, flattering, and appropriate. Remember, you’re a representative, so make sure that the image you project reflects well on the brand.